Ackermann’s Repository of Arts, June 1815. 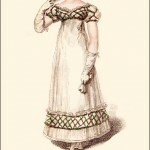 Note that the hem length is shorter here than in earlier years, a trend that continues through the end of the Regency period. 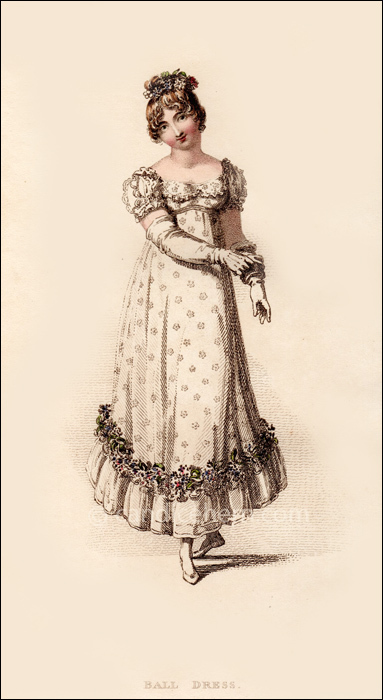 Some evening dresses may still show hems almost to the floor, but a ball dress was meant for dancing, and the shorter hemlines allowed for better movement, but also provided observers with both a tantalizing glimpse of ankle, as well as a clear view of the lady’s footwork in the dance. Even the stockings are mentioned in the description below, and they would seldom have been seen beneath earlier full dresses. This is one of the earliest mentions I have found of elastic stockings, though stretchable fabric, such as stockinette, was invented at the end of the 18th century.